Figure 7-18. - Placement of dry medicated cotton pellet. debris between appointments. Amalgam, zinc oxide and eugenol (ZOE), or. a commercially ready-made cement may be used for this purpose. If a medicated cotton pellet or temporary filling materials have been placed, these items must be removed and the canals irrigated and dried with paper points before proceeding to fill the root canal. Gutta-percha points or cones, available in various sizes are the most common filling material for a prepared root canal. An appropriate sized gutta-percha point is selected and may be shortened slightly to blunt the tip. The point is placed into the canal to a depth where the point seems snug when gently tugged. This point is referred to as the master cone. A radiograph with either the apical tile, or master cone point in place is exposed to verify the proper length. The tip of the master cone should provide an adequate seal of the apical foreman. This radiograph often is referred to as a master cone radiograph. If adjustments are needed to achieve the proper length of the master cone, additional radiographs may be exposed to verify the propel length. A properly titted master cone also allows space between the point and the walls of the prepared canal. Before the master cone is removed, a slight mark is placed on the point at the line where it is even with the opening of the tooth by squeezing the cotton forceps on the gutta-percha. The master cone is now ready for cementing. Mix the cement according to the manufacturer's instructions. The master cone is removed and a paper point is placed in the canal to absorb moisture that may accumulate. The consistency of the cement should be creamy but quite heavy. The dentist may choose to dip a lentulo spiral or reamer into the cement mix, insert it approximately halfway into the canal, and rotate it to distribute the cement onto the dry walls of the canal. With the master cone placed into the cotton pliers, the apical third of the cone is coated with cement. The cone is then inserted into the canal and seated to the mark made on the cone. The space between the cemented master cone and the walls of either the root canal or pulp chamber is tilled with additional gutta-percha points (accessory cones) of smaller diameter alongside the master cone. Filling the canal with additional gutta-percha points is done by inserting an endodontic spreader beside the master cone and applying lateral pressure to condense the cone against the walls of the canal. As the spreader is removed from the canal, a smaller additional gutta-percha point in inserted in the space. The process of lateral condensation and addition of gutta-percha points continues until the canal is filled completely. 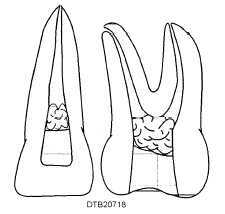 Figure 7-19 illustrates the steps in filling a root canal with the master and accessory cones. The excess length of gutta-percha is removed with a heated instrument. An endodontic plugger, also known as a vertical condenser, is used to condense the still warm gutta-percha vertically toward the apex of the tooth. More gutta-percha can be added if needed, and the process of vertical condensation continued until the canal is filled completely. When a tooth has more than one root canal, each canal is filled individually and each requires a properly fitted gutta-percha point sealing in it. A perfect sealing of the apical foramen in the roots of the teeth is essential to eliminate irritation of periapical tissue. Any excess gutta-percha and cement are removed from the pulp chamber and the chamber then sealed with a temporary restoration. Amalgam or composite materials may be placed to fill the carnal opening and restore the tooth permanently (fig. 7-20). Teeth successfully treated endodontically may also be restored with prosthodontics treatment, such as onlays and artificial crowns. As a rule, follow-up appointments are scheduled periodically for radiographs of the restored tooth. The dentist uses the post-treatment radiograph as an aid to determine the elimination of infection and progress of bone regeneration. The apicoectomy (root end resection) requires teamwork between the dentist and his/her assistants.